Our square vases look just as lovely as our round versions, but with a little extra edge. 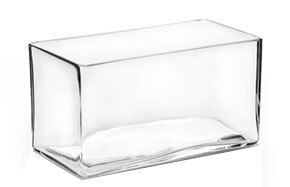 Each includes a distinctive cube shape with a flat bottom, smooth sides and an open top. Our website strives to provide you with a wide selection of high quality items so you can easily find exactly what you need to create the perfect event ensemble. 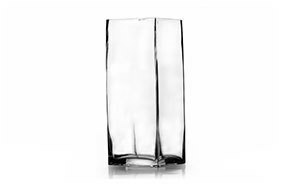 There are numerous ways to dress up our exquisite glass vases. A simple spray of flowers can add color without going overboard. If you really want to achieve a fuller effect, try packing in numerous blossoms for a complete bouquet or add a piece of floral foam wrapped in tissue or foil paper and place stems inside so they remain upright. The glass design is also ideal for holding water or colored liquid. A few river rocks or other waterproof material can be submerged while dainty floating candles hover near the rim. 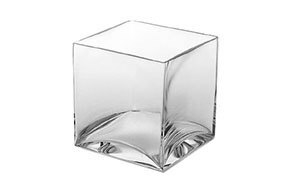 We provide multiple styles and sizes for our square vases. Make sure you view all options before choosing one or two for your table tops. You may find inspiration thanks to our unique layouts. The cube specific versions are shorter, with a height of 3” to 6”. Our block models stand taller, with even sides that stand between 6” and 28” tall. Taller containers are ideal for longer accents, such as peacock feathers or branches. If you prefer less height and more width, our rectangle pieces may be a better fit. Many of these products offer more surface area for liquid and floating candles. You can also create an organic scene showcased by crystal clear walls. Every unit is made with a flat base so your display doesn’t wobble or topple, even as guests shift the table covering when standing or sitting. Many of our products come in case quantities so you can submit a bulk order for larger venues. Try a single unit or work in multiple to create a completely new arrangement that will captivate guests and help build the right atmosphere for your celebration. Whether you are decorating for a wedding reception or putting together an anniversary party, reunion or birthday event, we can help you find practical items that will give you the best look. Before submitting an order, don’t forget to browse our catalog of vase fillers as well. We carry a rainbow of gorgeous gel pearls and cubes as well as glittering diamond confetti. Each completely changes the tone and style of the vase and draws attention to whatever you place inside or on top. Let us help you discover affordable components that can build a stunning display for any special occasion you host this year.